I have had a really good beard wash using Tactical Beard Care Beard Blitz Shampoo. Its a Tea Tree scented shampoo but the Tea Tree hasn’t been over done, it just gives the shampoo a nice fresh scent. One thing I look out for in a shampoo or soap is how much it lathers up, our water in Essex is hard and that cuts down on how much products produce bubbles. Beard Blitz Shampoo is made in Wales where the water is soft and so it would produce a good lather there. I only used a small amount of the shampoo, my face was soon covered in a soapy lather, Beard Blitz Shampoo gave my beard a really good clean and then rinsed off easily. The scent is very subtle and yet fresh and the 200ml bottle comes with a stopper with a hole so that you don’t pour too much out (as I would). Edit: It is now almost a year later and I have used the whole bottle, this has to be the best beard shampoo I have tested. My beard is left feeling not only clean but also so damn soft. This is really an amazing product. Beard Blitz Shampoo like the other Tactical Beard Oil products has won my acclamation and I have to give it a Gold Cup award! The Beard Blitz Shampoo was part of a kit that Tactical beard Oils sent me, packaged up in a plastic tough case that is a really nice part of the Tactical branding. Tactical beard Oils was dreamt up whilst some of our personnel were on tour in a hot and dusty enviroment and so the brand is very authentic. 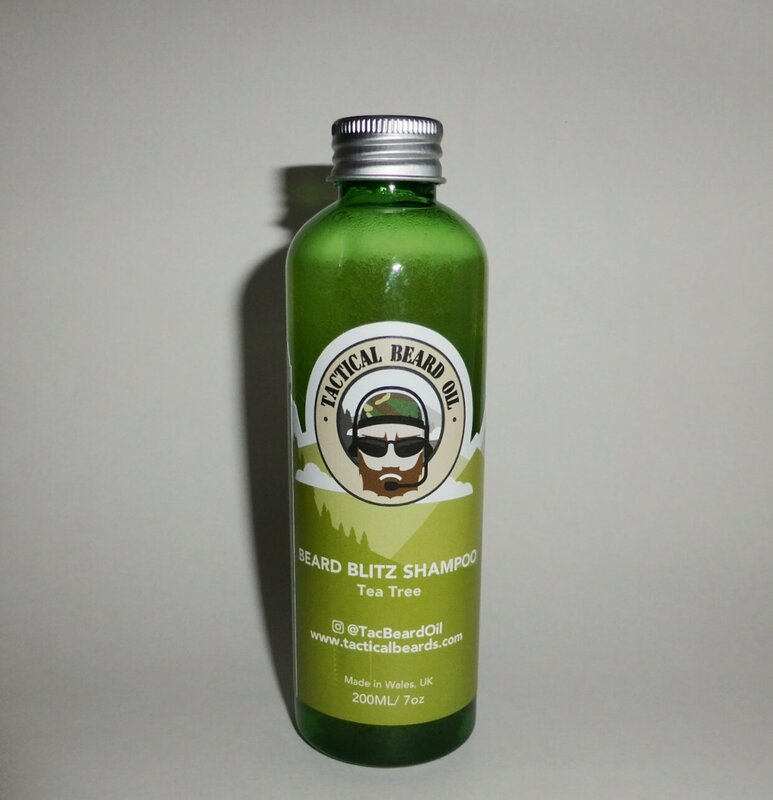 Beard Blitz shampoo costs £9.99 and is part of the latest product release and the re-branding. You can purchase your beard care products from the Tactical Beard oil website. Keep up to date with Tactical Beard Oils on Instagram and Facebook and Twitter.